As my solid reader base will have noticed I’ve been too busy to post lately. This is due to simple work-load dynamics. A little while ago I had exams. Keep you busy, keep you inside. Not much of note happened to me. I am currently kept busy with the final project of my Bachelor. This keeps me in school (and actually engaged in useful stuff) for much of my time. Outside of that I’ve been busy enough. Work, friends, RaphaÃ«lle and many many other things have been keeping me from writing here. This is the First Oral Presentation training video which comes with the project. I thought I’d share with you, some of you who haven’t seen me or heard my voice in a long time, what I look like now. Don’t worry too much about the actual presentation. It’s not something we’d actually do regarding the actual project. Just something we whipped up in the 1.5 hours before the presentation. Never, ever, ever imagine the audience in their underwear. Whoever managed to add that to “conventional wisdom” must’ve died laughing. 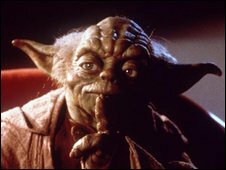 In the Star Wars films, Jedi Knights such as Luke Skywalker, Obi-Wan Kenobi and Yoda use the Force to battle the evil Darth Vader, who has strayed to the dark side. The Office for National Statistics did not recognise it as a separate category, and incorporated followers of Jedi with atheists. Last year, brothers Barney and Daniel Jones founded the UK Church of the Jedi – which offered sermons on the Force, light sabre training, and meditation techniques. Strathclyde Police employs 8,200 police officers and 2,800 civilian staff. Who is more Foolish, the fool? Or the fool who follows him?